20 | TH E M R EP O RT COVER STORY perspective, in that you have pro- grams in place to ensure transpar- ency with opportunities." She added, "The Dodd-Frank Act is a first step to bring about some awareness and it really shouldn't take a law to get people to do the right thing." For the future, Travis-Johnson hopes to get to a point where more women and minorities will take an interest in this industry because the numbers are dwindling down. Dana Dillard, EVP and chief customer officer of Nationstar Mortgage believes that a diverse company has an "appreciation for the differences in perspec - tive and thoughts that can add value to the business operations." This belief is reflected in the 52 percent of the Nationstar's staff that is comprised of women. "We have intentionally hired key leaders in the company that come with backgrounds and expe - rience different than the mortgage industry," Dillard noted. "These key hires have helped shape and influence our culture and business priorities. We will continue to evaluate our team to make sure we are meeting the ever-chang - ing needs of the home buying population—that's how you create competitive advantage." Global DMS is also making strides to diversify their company and business practices. Vladimir Bien-Amie, CEO and president of the company and AMDC member, says that forcing a policy on their staff is something they try to avoid. Forty-one percent of their employees are minorities and women. "Being exposed to different kinds of people brings a different point of view to things," Bien-Aime said. "As America changes and grows, organizations and companies are going to need to adjust to meet the changing culture." Bien-Amie also said that most corporate diversity programs aim to only increase the percentages of certain minorities in the overall employee pool to mirror the country as a whole. "This approach is a misguided and ineffective because it comes with an assumption that the potential employee must change to fit into the current workplace culture," he said. "Our approach was to change our environment so it embraces diversity in both culture and in opportunity. We believe that diversity is a strategic initiative versus a tactical one; the results are evident." First American's Mortgage Solutions is another company that is focused on bringing diversity and inclusion to the forefront of the mortgage industry. A few of the company's diversity initiatives include the Women in Leadership program, Recruiting for Diversity, and their Employment Engagement Survey. 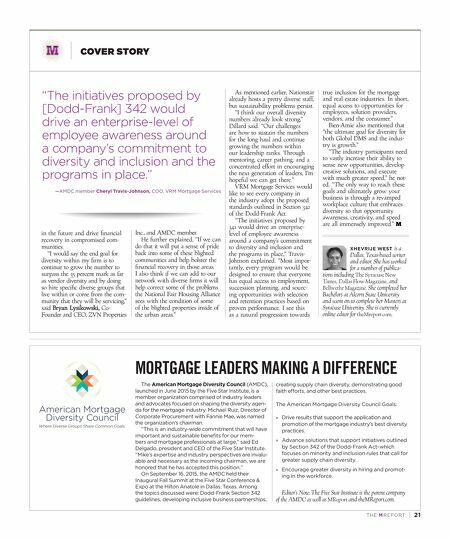 "Bringing attention to diver- sity and elevating conversations about diversity in the mortgage finance industry is positive," Wall explained. "We've taken the view that diversity is a business imperative. Our customers are diverse. Homebuyers are diverse. So, a diverse employee popula - tion will make companies more competitive." The End Goal A s more join the diversity and inclusion movement, the mortgage industry is sure to see a huge change, not only inter - nally, but also from the consumer perspective. By opening up the doors to people from a variety of backgrounds, the stereotype of working within this profession can and will be broken. ZVN Properties hopes to boost their vendor diversity numbers "A diverse company is one that assembles a talent pool across all levels …" says Fannie Mae's Director of Corporate Procurement and AMDC chairman Michael Ruiz. 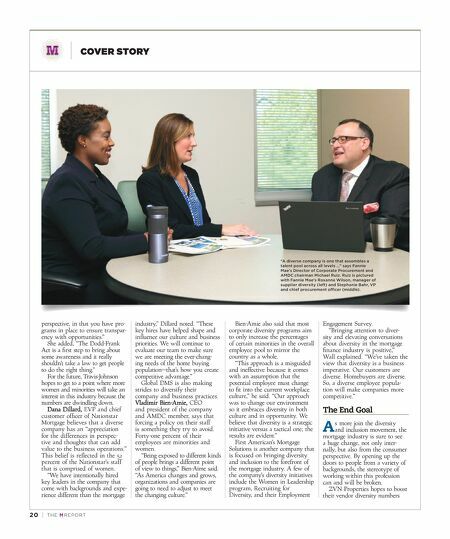 Ruiz is pictured with Fannie Mae's Roxanne Wilson, manager of supplier diversity (left) and Stephanie Bahr, VP and chief procurement officer (middle).